MAP Marine Technologies have signed an exclusive territory agreement with AMI Marine to distribute its products throughout South East ASIA. Sydney, 28th July, 2017, MAP Marine Technologies have signed an exclusive territory agreement with AMI Marine to distribute its products throughout South East ASIA. 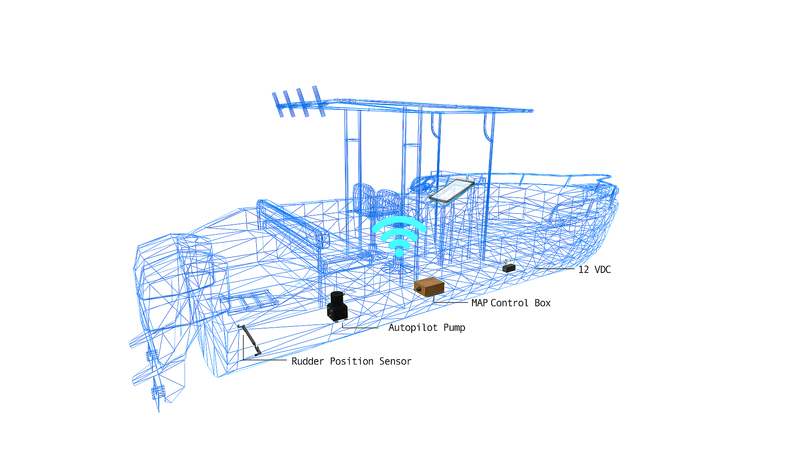 MAP Marine Autopilot, or MAP for short, is a state of the art autonomous boat control device, allowing users to completely control their vessel’s movement via an app on their handheld device. The mobile app interfaces with a compact, marine proofed unit, housing a GPS module, Wi-Fi, INS and solid state compass. This unit connects via Wi-Fi to a handheld android or iOS app device that facilitates rudder control, battery monitor and other steering commands, allowing the vessel to travel along a pre-selected route to its destination, and at any time the Skipper can take control with optional remote steering. While the MAP device is bound to steal the show at the Sydney International Boat Show, appealing to all boating enthusiasts with its numerous recreational applications, AMI Group Managing Director Vince Tranchita says AMI are also excited to demonstrate the MAP Pro system, a conversion kit built by MAP-Tech that transforms regular boats to Unmanned Surface Vessels [USVs] operated from the remote ground control station. Vince added, "AMI, as a forward-looking organisation, we are continually eyeing developments in the maritime industry. Moving into the USV sector is a natural progression and this project is something we are excited to pioneer. As a company we are proud to be associated with such an innovative product as MAP Tech." MAP-Tech's Australia Director, Matt Howarth has commented on the compatibility of the partnership, "we are very happy that a well-known and respected company like AMI Marine have chosen to distribute our product range in the ASIA Pacific region. We look forward to bringing this exciting technology to the market." Customers appreciate the simplicity of the system and the convenience of using their own devices; “I always carry my mobile phone with me so I love how easy it is to use my mobile device to plot waypoints and to remote steer the boat. This is a truly innovative solution that is easy to use and enhances my boating experience.” Omar Aker, UAE Boat owner and MAP systems user. MAP comes pre-loaded with navigational charts, and allows the user to manage unlimited waypoints and routes. Highly precise, the GPS horizontal accuracy of the system is within 2.5m.The ultimate convenience, MAP is a digital crewmate, capable of combining a navigator’s expertise with a steady hand at the wheelhouse – leaving users to fish, entertain or plan their next destination. Excited by MAP’s capabilities for your vessel? Contact AMI for more information about this revolutionary new release. AMI offer a vast portfolio of products across Marine Electronics, including Navigation and Communications, Environmental systems and more. With over 30 years of experience and branches Australia wide, contact AMI for more information about MAP for supply, new builds and retrofit projects. Their interest in marine autopilot solutions commenced in 2009, and was awarded great dedication that eventually led to the creation of the MAP-Tech division committed to the development of autopilots and marine technology systems, with the vision to become the common Marine Auto-Pilot and USV solution provider for every vessel and unmanned requirement. A multifaceted portfolio of companies including marine sales and equipment service, safety products, electronics manufacture, satellite communications & airtime, navigation charts, and water treatment & purification, for leisure, commercial, defence and offshore marine interests. Specialist products, accessories and services for sailing, caravan and RV customers. AMI Group partners benefit from extensive service coverage across Australasia, combined buying power, inter-agency support and an established logistical network.